The Track Family Fun Park is one of the most popular attractions in Branson where you can find many kinds of thrilling rides and adrenaline pumping activities that you and the whole family can enjoy. The park has four fun-filled locations in Branson. Each location offers many thrilling rides including go-karts, bumper rides, bumper boats equipped with supersoakers, kids rides, and the incredible 100-foot tall super swing Skycoaster, and many more. The park has been providing great entertainment for over three decades with no gate admission to people of all ages. At the park, you can enjoy even more with so much fun if you try the Go-Card loaded with 160 credits. You can enjoy a great time along with your family inside the park by sharing this card and no need to buy more than one. Your credit balance in the Go-Card can be used on all rides and attractions including arcades and kids’ rides. The best part with this deal is that you can recharge this Go-Card for only half price at any Track location. Plus, after you purchase this Go-Card, you will receive a free one topping sundae from Andy’s Frozen Custard, a free G-force ride at Track 5, and one free tip to Pizza World Buffet. When you spend a wonderful day at the park, you will always find a perfect ride that suits your age, weight, and height. The park has about 14 different go-kart tracks, so there’s no reason that you can’t enjoy the best ride of your life. Many of the exciting and thrilling ride activities at the park will you experience and exhilarating and heart-pounding ride that you haven’t experienced before. One of the newest and most thrilling rides that you can enjoy at the park is the Heavy Metal High Rise. This thrilling high rise ride that you can greatly enjoy at the park is a steel and concrete go-kart track that extends over four stories high at Track 4. This exciting go-kart ride is 1,200 feet long and consists of 200 tons of steel and 700 cubic yards of concrete. A fantastic ride that you can experience with Heavy Metal High Rise will let you experience a spiraling, twisting, elevating, and turning with so much fun on the concrete track. It’s really great to enjoy a spiral ride from atop equivalent to four stories high and goes down with a thrilling three-tiered slope back to the ground. Another thrilling rides that you can enjoy at the park are the two go-kart wooden tracks namely Wild Woody and The Lumberjack. Wild Woody is a high-rise wooden track that offers a twisting and turning ride. This is a fantastic ride that you don’t want to miss to drive in Branson. Its highest point at four stories and a length of 1,440 feet, Wild Woody looks like an oversized roller coaster. Beautifully located at Track 3, this wooden ride is a kind of go-kart racing that has ups, downs, twists, and turns and offers a great view too. Height requirements for this ride is 36” and up for passengers, and 58” and up for drivers. The thrilling Lumberjack ride at the park, which have been converted, from mini-golf course, is the original wooden high-rise go-kart track in Branson. With the height of about three stories high, this unique go-karting experience will take you to new heights with two huge spirals of fun. Built in 2001, Lumberjack is still the favorite track of ride enthusiasts. The fantastic race track of this thrilling ride features a smooth wooden surface, 2 full spirals, 1 blind peak, and a logging theme around the track. Lumberjack has the same height requirements as Wild Woody. Another exciting track that you can enjoy at the Track Family Fun Park is the Road Course Track. This unique track offers tighter and higher banked curves and has more elevation changes than a traditional concrete track. Road Course Track features a longer track design that has the capability to handle more go-karts than the Classic Track at Track 3. This unique go-kart ride is sure to give you an awesome ride experience. Sprint Track is another exciting track that can be enjoyed only by grown-ups (with valid driver’s license requirement – no passengers). This track is similar to kids’ go-kart track. Conveniently located at Track 3, this track is only 275 linear foot banked track. This concrete track has banked corners, and it is the fastest go-karts of all tracks. Only drivers with valid driver’s license are allowed to drive at Sprint Track and must be at least 54” in height. If you want to try a thrilling ride sensation which offers family-friendly go-kart ride experience in a concrete surface, go for Classic Go-Karts. This go-kart ride can be enjoyed at Track 3, Track 4, Track 5, and at the Track Pirate’s Cove. Each of the track design in all tracks is unique, and the go-kart models even vary at the different track locations. The classic go-kart at Track 3 was the first track that opened in 1981. Another go-kart thrilling ride that you can enjoy at the fun park is the Kiddie Go-Karts. In this go-kart ride, kids are behind the wheel and they make their own direction. This go-kart ride provides kids a perfect ride experience even for a 4-year-old kids driving in a controlled environment. Parents watching the kids drive are sure to take a photo of them maneuvering by themselves. For much older kids, Rookie-Go-Karts are the ideal rides for them. As they are bigger, it’s easy for them to move with ease as the track designs have larger ovals. The Rookie-Go-Kart ride can help kids gain mastery and they could become more comfortable behind the wheel when they move up to the grown-up level tracks. Besides the go-kart rides, the park also features amusement rides at Kids Kountry at Track 3 and 4. Kids that are spending a wonderful vacation in Branson are sure to enjoy a fun ride if they come to visit and try thrilling ride activities at Kids Kountry. They will surely love the many thrilling rides at the Track Family Fun Park where many of the rides are sized just for them. 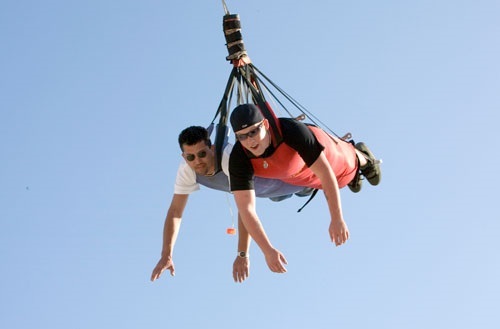 The 100-foot tall super swing Skycoaster is another thrilling and exhilarating ride that you can enjoy at the park. This super swing combines elements of hang-gliding and skydiving. To start a thrilling ride with this giant swing, you will be harnessed and pulled up 100 feet in the air. This great ride can be experienced with one, two or three people at a time. Once you are pulled up from below you will feel a breathtaking 70-mph swinging adventure. You will also enjoy bumper rides at the park where bumping is a must. Bumper boats are a great way to enjoy thrilling rides on the water with great fun activity. Bumper boats or Supersoaker boats are equipped with water cannons that make this boat ride a unique water fun activity where bumping and soaking is key to strategic water battle. If you like to enjoy a bumping activity without soaking, try the bumper cars at Track 4. 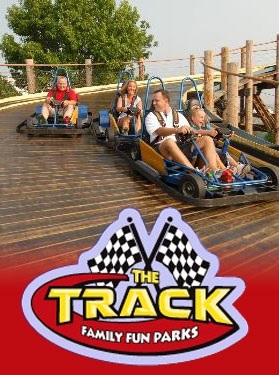 The Track Family Fun Park is one of the best attractions in Branson that offers tons of fun and heart-pumping activities for the whole family.